We talk a lot about diverse, healthy soil being essential for or lawns and other landscape plants; but did you know that exposure to bioactive soil is healthy for humans as well? Many of us know how therapeutic it can be to spend some time outdoors and in the garden. 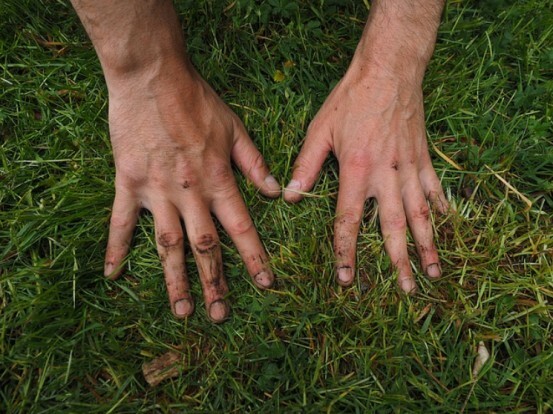 Studies have shown that getting our hands dirty can have positive effects on our well being and that time outside improves our ability to learn. Soil is filled with millions of microorganisms, including some that have an affect on our personal chemistry. A specific soil based bacterium, called Mycobacterium vaccae has been shown to have a positive effect on our serotonin levels, reducing anxiety and stress and increasing our sense of contentment. Spending time outside exploring, playing in the dirt, and enjoying fresh air and sunshine is important for us and our children. Many of us live in an overly sanitized world in fear of germs, which is diminishing our immune resistance. Scientists have labeled this the “hygiene hypothesis.” Allowing kids to go barefoot, make mud pies and even eat dirt is not only ok, it’s good for them. Research is proving that contact with microbial biodiversity is the key to why kids in rural areas and on farms have fewer allergies and immune disorders. Children that spend plenty of time outdoors learn to connect with nature and to develop curiosity, compassion and respect for plant life and the various creatures that inhabit our planet. Through this understanding of nature, they grow up to be better stewards of the earth. This is one of the biggest reasons our clients choose organic landscape maintenance. Not only does it reduce chemical exposure, your kids and pets who love to get a little dirty can do so safely. Good for you. Good for plants. Just as microbe exposure can be good for you, so is eating vegetables grown in biodiverse and nutrient rich soil. Such plants tend to offer more micronutrients; plus the surface area of these vegetables has millions of beneficial microbes that aid our bodies in digestion and other processes. With the fast pace of modern life, it’s easy to find ourselves disconnected from nature. So if you’re feeling a bit stressed, get outside and get your hands dirty – it does a body good!